You have to feel sorry for Joaquin Caldez. In June of 1828, he claimed that he’d settled 640 acres on the north side of the Oyster River some eight miles from Tampa Bay. He submitted the affidavits of two witnesses to support his claim. He was an actual settler in possession of the land, he said. “Unconfirmed” is the official ruling. As The Legal Genealogist prepares to head off to Florida for the Pinellas Genealogy Society’s 2018 Seminar in Largo, the usual routine of poking around in Florida’s legal records is well underway. And it’s always fun… because Florida has such a long and rich legal history. All of which didn’t help Joaquin Caldez one bit. Because he wasn’t claiming under a grant by anybody — not the Spanish and not the British — but solely on the basis of having settled the land and worked it for years, he and his witnesses said. But his proofs weren’t enough. So… how do we know? But we have to dig a little deeper for the rest of the story for Joaquin Caldez. What’s that? And where do we find it? According to the Library of Congress, “The American State Papers, comprising a total of thirty-eight physical volumes, contain the legislative and executive documents of Congress during the period 1789 to 1838. 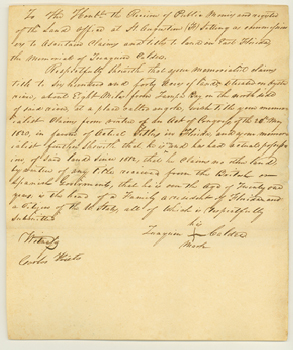 The collection includes documents that cover the critical historical gap from 1789 to the printing of the first volume of the U.S. Serial Set in 1817. The books are arranged into ten topical classes or series”7 — one of which is Public Lands. And every last one of these 38 volumes is online, free, at the Library of Congress, through its American Memory project in a collection called American State Papers, 1789-1838. We click on the link for the set of eight volumes of the American State Papers on the subject of Public Lands, and scroll down to volume 5. Choosing the page-turner option, we can enter 409 in the box at the top that says “Turn to Image” and it takes us to the start of the report by the Register and Receiver of East Florida in 1828. And … ooops… there’s no reference to the Caldez claim there at all. Hey, I didn’t say this was going to be easy, did I? Turns out it’s actually over in volume 6: there’s a report on page 58 reflecting that a number of claims under the Donation Land Act of 1824 were rejected, and an alphabetical list starting at page 59 of all the claims reported on in 1828. Most of those claims however weren’t accepted. It’s in that brief reference in the American State Papers that we find out that there were 70 applications — 12 were confirmed and four “recommended to Congress for confirmation,” which means that 54 were turned down. Including the one filed Joaquin Caldez. And win, lose or draw, well worth the effort to chase down. A nail biter! I wonder what happened to him! In addition to Article 8, there were 1800 claims under Article 11 of the Adams-Onis Treaty. I have not located where in NARA these are kept. The claims under almost all treaties the US has signed are interesting sources of records. Land for Spanish West Florida that was east of the Perdido river is found under Florida in US government records. The lands west of Perdido river are listed under Louisiana (not Mississippi or Alabama). This is due to Madison’s claim the Louisiana Purchase extended to the Perdido River, now the Florida Alabama state line. This post has links to downloadable pdf files of American State Papers by volume on Internet Archive.